Visual Studio Code>Themes>Alabaster ThemeNew to Visual Studio Code? Get it now. 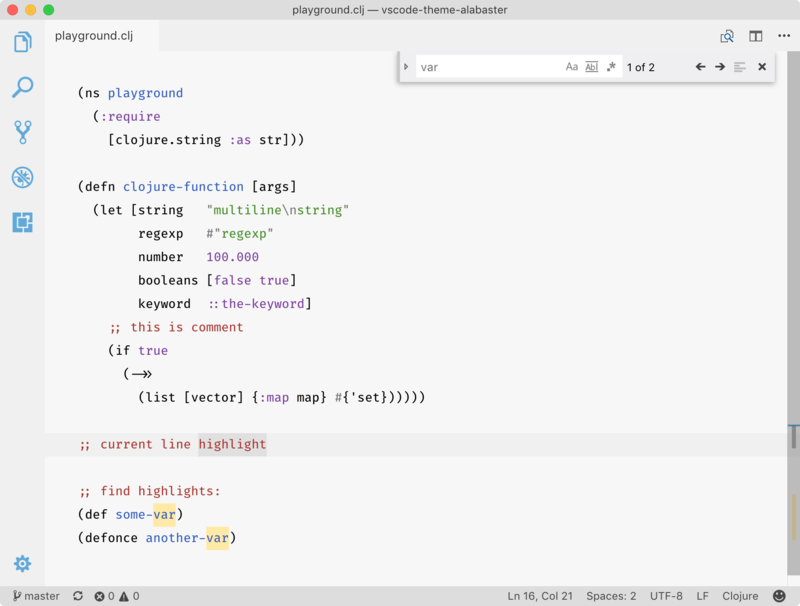 A light theme with minimal amount of highlighting for Visual Studio Code. Most color themes highlight everything they can, ending up looking like a fireworks show. Alabaster highlights comments. Most themes try to dim comments by using low-contrast greys. I think if code was complex enough that it deserved an explanation then it’s that explanation we should see and read first. It would be a crime to hide it. Having minimal amount of rules means you can consciously use them to look for the exact piece of information you need. Most other “fireworks” themes provide only one meaningful contribution: if it’s colored it’s probably syntactically correct. Instead, in Alabaster you can actually remember all the rules, and e.g. if you need to look for a string you know that you’re looking for a green token. And all the strings really pop out because there are not many other things highlighted.